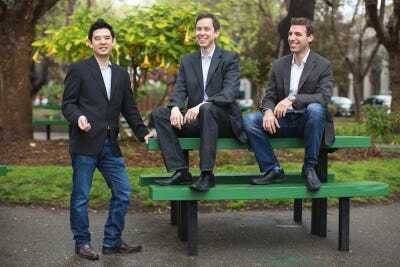 ZenpayrollZenPayroll cofounders, from left: Edward Kim, Joshua Reeves, Tomer London. The payroll-processing startup ZenPayroll just announced more than 50 previously undisclosed angel investors, and the list reads like a who’s who of Silicon Valley. The investors who joined the $US20 million Series A round range from celebrities like Ashton Kutcher and Jared Leto to Karen Mills, the former head of the US Small Business Administration, and a laundry list of famed startup CEOs from Evernote, Eventbrite, Stripe, Constant Contact, SurveyMonkey, WordPress, and Instagram. Founders from PayPal, Yahoo, Reddit, Nest, Twitter, HubSpot, and Mint also contributed. “We pretty much got our dream list of investors. And we’re really grateful,” he told us. “It’s always great to invest alongside great entrepreneurs and VCs,” PayPal cofounder Max Levchin told us in an email. ZenPayroll hopes to eliminate the notorious headache that is payroll processing. The company hopes to streamline the complicated systems of legacy vendors like ADP and Paychex by offering a simpler cloud-based system that can automate all payroll tax calculations and payments, as well as provide direct deposit to employees. The app also allows for paperless filing of all payroll-related government documents, the ability for employees to donate a portion of their paycheck to charity, and easy-to-read, visually clear pay stubs. ZenPayroll has more than quadrupled its rate of payroll processing since its first round of funding, currently processing over $US1.5 billion in annual payroll for thousands of small businesses across the United States. “Right now we have a very strong focus on small businesses, and sub-100 person companies,” Reeves says. ZenPayroll plans to use this latest round of funding to complete its nationwide expansion and eventually grow to support larger companies.